How did we win this game? No, really, how did we win this game? I went into a political potluck in the bottom of the fifth. Barry Zito had just struggled through four rough innings, but the Giants were still in the game. Of course, they were finding new and exciting ways to keep off the scoreboard, and another chance went squandered in the top of the fifth. Then, Justin Miller came out and walked the first two guys he faced. I shut off the radio and went inside. Two hours later, after snacking on garbanzo salad and egg rolls, I came back out to my car and turned the radio on. The boys were in the middle of the postgame wrap, and it took me a few seconds before I figured out they were celebrating a victory. I pounded the steering wheel in disbelieving jubilation. By the time I watched the highlights, I already knew the tale, and it made perfect sense. After all, any improbably victory always begins with a break. This break, as with the best of them, had history. I’d go into all the juicy details, but before I could put my thoughts down on virtual paper, Andy Baggarly went and beat me to it (see second note). I suppose I could tell you it was the first thing that flashed across my mind’s eye when I saw the replay of Cameron’s Jose Cruzian drop, and I could hope you’d believe me. But it just goes to show that great minds think alike. 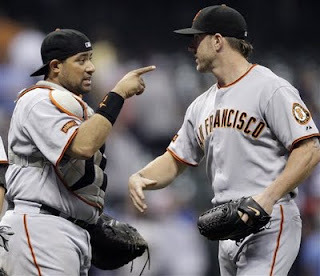 Kudos to Bengie Molina for keeping his focus after the Buster Posey call-up and subsequent heartwarming chat with Bochy. He’s taken a lot of flak for a guy who’s been the most valuable player on the team since 2006, but he goes out there and does his job — and does it well — day after day, night after night. This is the second go-ahead jack he’s launched in a little more than a week. The last one he hit on one leg. If there’s anybody out there who questions Big Money’s determination and intensity, you’d be wise to start paying attention. He’s going to earn his keep in September. In the end, all thanks are due to the ‘pen, which recovered from Miller’s dubious entrance to shut down the Brew Crew over the final five frames, paving the way for the unlikeliest victory of the season. 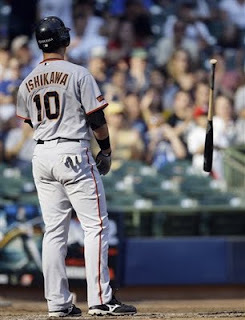 The Giants won despite their pitchers combining for 10 walks, a season high. Well, that took long enough. Seven winless starts must’ve been enough for Matt Cain, who gave everything he had over seven-plus, and it must’ve been enough for the rest of the Giants, who scratched out three runs and held on for dear life as the spry but powerful arms of Ryan Braun and the sheer girth of Prince Fielder sought to crush the dreams of our unassuming ace, who finally equaled his career high for Ws. After that six-week ordeal, No. 14 should be a breeze. I can’t tell you how much it would’ve hurt to lose this one. When you’re playing in a yard with as many ghosts as Miller Park has for the Giants, you’ll take every break, every hit, every run, every win you can get. And this one was surely gettable. But that didn’t prevent our heart attack boys from nearly letting another one get away. 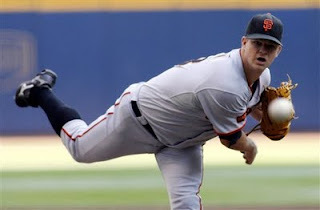 You can’t say enough about Brian Wilson’s guts. To come out and shut the door the past two nights, especially after the goings on during the Giants’ last visit here, takes a short memory and a whole lot of swagger. It’s pretty obvious Big Weezy has both. That said, there’s not a day goes by without me wishing he hadn’t made this the Year of the Mohawk in the Giants’ clubhouse. Pretty soon, Bochy’s gonna be rockin’ one, and then we’ll know the rapture is near. The broadcasting combinations regurgitated upon the American people by Fox Sports are enough to make even the most casual fan want to puke. Not all that quietly, Uribe is hitting .321 over his last 17 games, with five homers and seven RBI. Prince Fielder had better not show his face in San Francisco until the Brewers return here in 2010. If he does, the fat f**k may not make it out in one piece. This all started out so well. Three batters, two hits, run. How hard is that? Well, I probably should’ve taken Renteria’s inability to lay down a bunt as a bad omen. But when this team scores, you tend to overlook the whys and the wherefores. The run is the end. The means matter not... Eleven innings later, I was creaming for a sacrifice bunt, a sacrifice fly, a grounder to the right side, a ground ball with eyes, anything but more of the same futility. Over his first nine road starts, Sanchez went 0-8 with a 6.60 ERA. Since his first road win at Houston on August 4th, he's 2-1 with a 1.16 ERA and .154 opponent's average in five starts away from the Cove. That, my friends, is unreal. Many more props are due to the ‘pen for another gargantuan effort, especially to habitual tough-luck loser Bob Howry, who was saved from yet another L by the soft hands of a Panda. So hats off to Medders, Runzler, Romo, Howry, and Valdez. The game may never have seen a more dominant starting staff, but they’re backed up game after game by the most relieving relief core in the bigs. As for Fielder the Younger... I understand his daddy didn’t treat him right and he’s got some maturity issues, but someone has got to check this guy before his attitude gets out of hand. Anyone who follows the A’s knows that someone won’t be Ken Macha, who has to be the most uninspiring field general in the history of professional sports. (This guy looks lost down there in the dugout, looking to the heavens for answers as his team collapses in the summertime heat — yet again.) I say Bob Uecker should get up in the big fatty’s grill and give him a lesson in respect. It’s a lesson he sorely needs to learn before his health — and the health of his teammates — is put in jeopardy by his endless antics. Of course, his love of the postgame buffet table could be more hazardous to his health than the next pitch thrown his way by a Giants pitcher. Lost is all of this, a-way back in the first inning, Gino Velez made the defensive play of the year. Rowand’s catch to preserve the no-hitter was an instant classic, but this was an impossible play, and Count Chocula made it look easy. Oh yeah, and Aaron Rowand became the first Giant to hit into a triple play since J.T. Snow on August 5, 1998. The Giants are an even 19-19 in one-run games this season. In those 38 games they've scored 97 runs... and allowed 97 (2.5 per game). You can’t be upset about the last one when you probably should’ve lost the first one and you won the one in between by the slimmest of margins. It was a microcosm of a road trip that saw the Giants hold two of the highest-scoring clubs in the league to nine runs and find a way to split six games. But you can’t be upset. You can’t be upset because this is the team we have to work with. Nothing has changed all season and nothing projects to change between now and October 4th. This team is going to have to find a way to be two games better than the Rockies down the stretch. With 16 of 25 remaining games at home, where they enjoy the best record in the NL and seem to play with a bit more spring in their step, I like their chances. Wear your orange and bring your game face. It’s officially crunch time.